Writing is one of the most effective ways to talk to your subconscious. It is always good to confide in someone who best understands us and gives advice for our betterment, which is our inner-self. When you write to your own self you will not have to worry about outside opinions and thoughts. That’s how the thought of writing a dream letter to inner self arose. And this is what every individual would like to write to his or her subconscious. How long has it been since we had a good time together? When I listened to your heartfelt desires and you to my fear of failure or stories of success. I will not blame you because I am the real culprit. You have always witnessed my moments, tried utmost to keep apace with me. But I was in some other drift, working hard to make money, thinking hard to capture temporal bliss, caring more for what others cared to listen. In the process, I did not care to give you the due love and attention you deserve. I forgot the real cause of my existence, that is, to nurture my soul. Today, my dear Self, I want to give you some gifts. Gifts, which I should have given you long back. Gifts, which you always yearned for but never told me since you wanted me to think of it. This is the precious gift of 13 promises which only I could give you. 1. I will have daily-talks with you and I assure you it will not be rumination. I will tell you what I did the whole day. You will tell me whether everything was right or something was amiss. I will ask for suggestion and redemption. You will give me motivation and positivity for the next day. Let’s keep this conversation alive forever. 2. I will do all that which you like, which will help you prosper and flourish, which will uplift you spiritually. I have realized that ours’ is the relationship more precious and important than all others. 3. I will make your abode healthy. I know I have damaged your home, my body. I will make amends in my lifestyle to make it more comfortable for you. Where you can drink life energy and can breathe purity. 4. I will devote more time to my hobby and passion. The source of your energy and happiness is the little, cute, relaxing moments I used to spend with music, nature, art or with books. That’s why you often advise me to slow down and take it easy. 5. I will not be afraid to speak my heart out. I will speak with honesty but without being tactless, consciously aligning my words and your thoughts. 6. I will value myself. I know self-respect is your priority and you have always yearned for it. Whenever I felt dejected you whispered, “you have everything you need within yourself”. I wonder why didn’t I believe that! Now I promise to hold this remark high in my regard. 8. I will respect your freedom to think and will never let my critical mind to hinder you in the process. 9. Before going to that mirror which reflects me but not ‘you’, I will come to you. You are my mirror and you will show me my true and exact reflection. I promise I will believe what you will show me. Even if it is going to be hard sometimes, I will accept it. 10. I would try to be worthy of keeping you in me. We have descended together from our heavenly abode, united in the same form and with the same perception. I was prone to the influence of the outer world, you were not. The distance which I have created between us will be removed by me. 11. I will meditate to make you feel happy and to make me feel at peace. This is the only way I can configure my thoughts and strengthen our bond. I hope one day I would get to listen to your voice with utmost clarity. 12. I decide to be ‘you’. I decide to be ‘myself’. I want to experience the transition from stressed to serene, from the periphery to the core, where you stay. 13. Last but not the least, I will forgive myself for any mistakes I have committed in the past. I will shed off the guilt of not being up to the mark often. I will forgive myself for being judgmental for something which was beyond my control. Dear Eternal, I love you for believing in me, for guiding me and for loving me unconditionally. I thank you for reminding me often to absorb every moment of this amazing life and to not let my inner child die. Today I want you to know you are not alone. I am here for you. I love you and appreciate you for who you are. 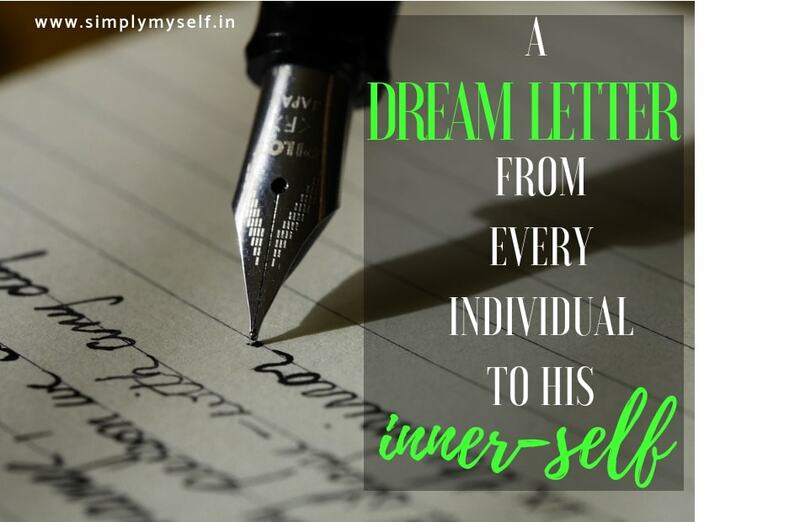 Would you also want to write a dream letter to inner self? What promises would you want to make ? Here is a beautiful promise chart for you to write your promises and keep somewhere you can daily look at. Download it. Here’s why Realistic Positive Thinking is better than Positive Thinking. This is great! It’s so easy for us to put ourselves aside and keep pushing the importance of self-care over for the next in line. When we take time for ourselves our entire health pattern lines up and strengthens. Thank you! Great post! Talking to myself through writing is a fantastic outlet. 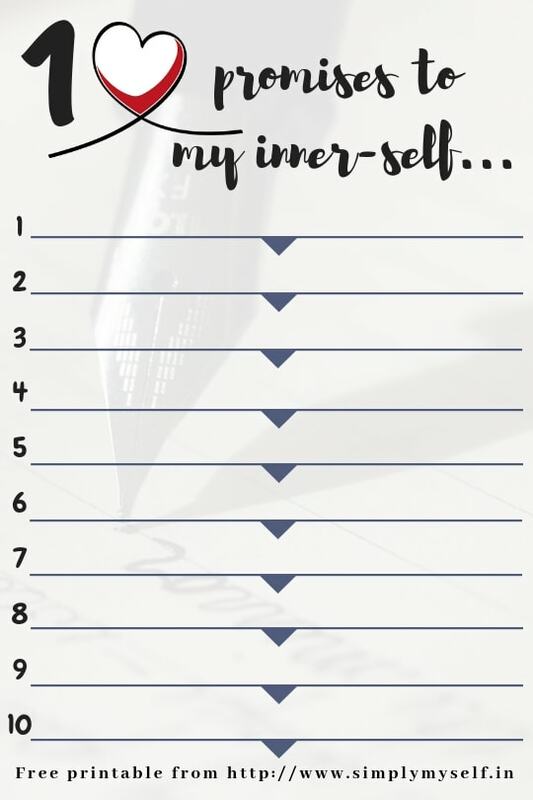 I think many people underestimate the therapeutic value that writing can have and think that they have to write, “Dear Diary” style, but really, writing to ourselves looks different to everyone, and it’s whatever works for you – whether that is a letter, diary, post it notes, messages on the mirror, etc.